Not much to choose between the two, although averaging more readings does reduce the scatter just a bit. 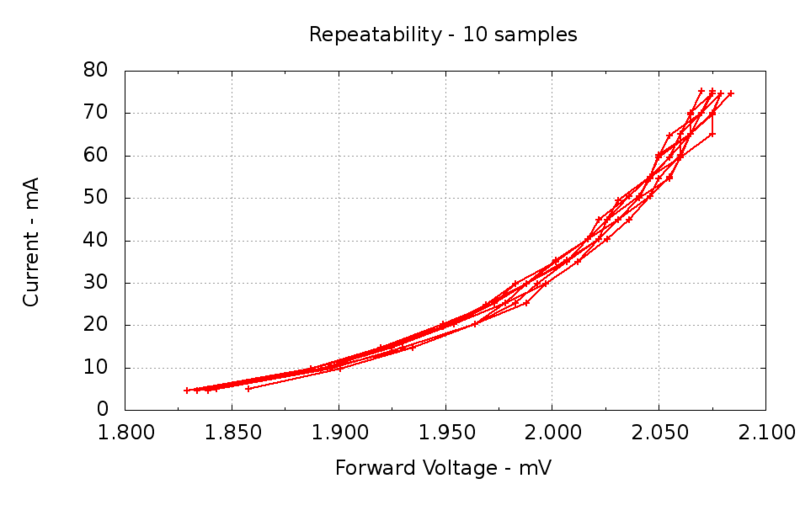 The ADC resolution is 5 mV, which is painfully obvious along the X axis. 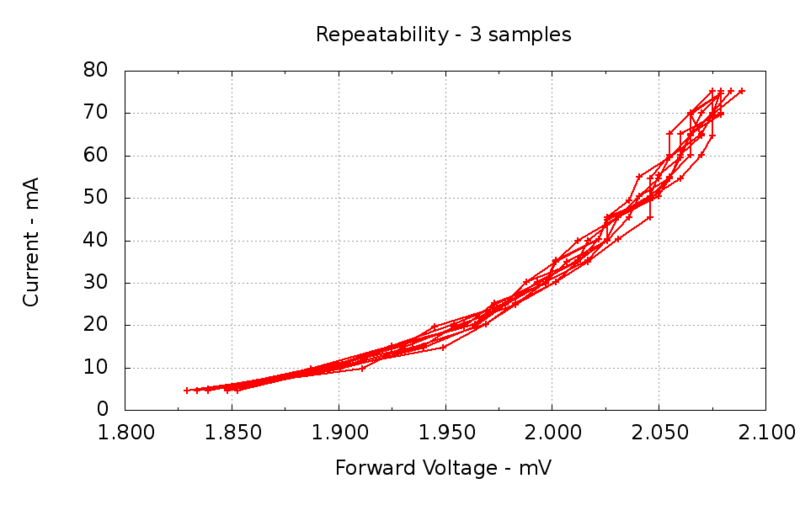 The Y axis has a smaller spread because it’s the independent variable: the firmware sets the MOSFET gate voltage to produce a given current and the ADC steps are relatively larger (the input voltage is only 75 mA × 10.5 Ω = 800 mV, tops). I think it’s close enough for my simple needs. set xlabel "Forward Voltage - mV"
set ylabel "Current - mA"
#set y2label "right side variable"
#set label 1 "Comment" at 0.90,0.35 font "arialbd,18"
This entry was posted on 2012-07-30, 07:45 and is filed under Electronics Workbench, Software. You can follow any responses to this entry through RSS 2.0. Both comments and pings are currently closed. and back into the test lab! And that’s an order; it should keep you from seeing pixels in your sleep! The graphs come from Gnuplot and the post now has the Bash script that makes it happen. Should have put that in the first time. Thoughts from an old test engineer (“retired” in 2002 as part of the dot-bomb implosion). How much (if any) of the jitter is due to heating of the DUT (er, Device Under Test). At your higher currents, you might be seeing 14C junction temperature elevations (from a SWAG of 100 degrees/watt for the package), and the thermal time constant(s) will get you. I need to get up to speed on gnuplot. I used to use plotmtv, but the last time I looked, the source was hard to find, and the package hadn’t been supported in a few years. That was 10 years ago. Nice 3D capabilities, along with the ability to rotate the viewpoint on the fly. OK, I’ll extract the first and last two runs from that average-of-10 dataset, plot ’em with some ID, and see if there’s any progression. Nice 3D capabilities, along with the ability to rotate the viewpoint on the fly. Gnuplot may have Borged those features, as it can do all manner of 3D stuff. I used a very small fraction of its capabilities to plot those WWVB reception noise graphs and it worked well for my simple needs. The data sheet should/might tell you the thermal resistance of the package, either in junction to ambient or junction to case–depends on the application and mounting. The old HP optoelectronics catalogs had this data in the back of the sheet.